Mine was one of several on Friday billed in the "Leveraging Technology" strand. All the presenters appeared on a panel discussion at the end of the day. I give the NCTM program committee huge props for putting the strand together. In previous years, there were complaints that NCTM had not tapped into the voices, experience, and community going on in MTBoS every day. My interpretation is, this criticism was heard, and this strand is progress. 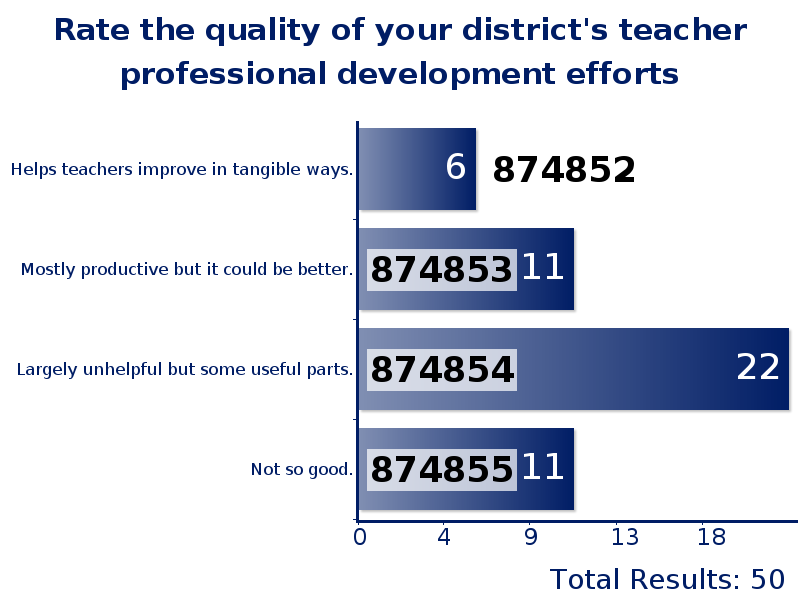 My overall thesis was that in many places, the professional development opportunities offered to teachers are not good enough to result in consistent improvement in their practice over time. And that starting a blog about what is going on in their classes can be a really effective way for teachers to take responsibility for their own professional growth. I owe a big public thank you to Ashli Black, Sadie Estrella, Chris Lusto, and Meg Lane for sitting through a rehearsal Thursday night and offering thoughtful criticism and feedback. And an extra thank you to Ashli for suggesting some very positive changes in the weeks leading up. I didn't want to just post slides, even though that would have been way easier than writing this all out, because they wouldn't make any sense by themselves. So you're welcome. I have the capacity to do this well. Learning to do it really well would require focused, sustained, intentional preparation and practice. I am undecided whether this skill is important enough to me to take the time to develop it. But that's where I am on that. I was glad that the second and third options were the most frequent, because that was what I was prepared to talk about. Hooray! And here is a snapshot of some of the rock stars who came to see me and sat in the front row. I am a lucky one, indeed. I started with a little story about how terrible I was at teachin' school in my first few years. The intention was mostly to be funny and get the audience to like me. But every word was true. In order to do something about that problem, I started poking around the internet. I found that there were people sharing their lessons -- like, what was actually going on in their classes -- with narratives and media and supporting documents included. And they were good. I said an especial thank you to Dan for being a pioneer in this area, except I didn't address it directly at him, even though he was in the audience, because I spazzed. Also mentioned: Jackie and Sam. I started writing because I had to. I was coming up with some good stuff, or had ideas for some good stuff, and I needed to share them. I'm not sure if this itch can be learned, but I tried to get the audience to experience it. First, I said, think of something that went really well this year in your class (or a class you're involved in). I put up a 30-second timer to give people a chance to think of something good. Then, turn to a neighbor for two minutes and tell them about it. People were game. It got satisfyingly loud and animated. After four minutes (two for each partner), we regrouped, and I asked a volunteer to share what she talked about with the room. Then, I asked her how that felt. The point I was trying to make was, it's satisfying when you try something that goes well in your classroom, but it's deeply satisfying when you know that your insight and planning was put to good use by hundreds of people all over the world. We know this sort of reflective summary of our work is a valuable activity for learning. We know it because we assign portfolio assessments to students. We know it as a profession, because National Board Certification for teachers requires four portfolios. Four! Also important: most teachers do not spend their whole career in the same place. Having a record of your professional growth and a collection of your best work is very helpful when you apply for new jobs. Then I cited one example of posting a lesson that I wasn't happy with, soliciting feedback, and then posting the update. I had initially planned on using the example of the introduction to right triangle trig (original) (revised). However, I was afraid it would take too long to explain the gist of the lesson, so instead I went with a problem set used to help Algebra 2 students review what they know about equations of lines and extend it to point slope form (original) (revised). In hindsight, I should have stuck with the trig stuff; it was meatier content and had better visuals. The upshot: once you have a critical mass of readers who are active in this community, you can tap into a hive mind of experienced, generous, knowledgeable folks who will help you work out the kinks in a lesson. And this was the thing I wanted to communicate most loudly and most clearly. 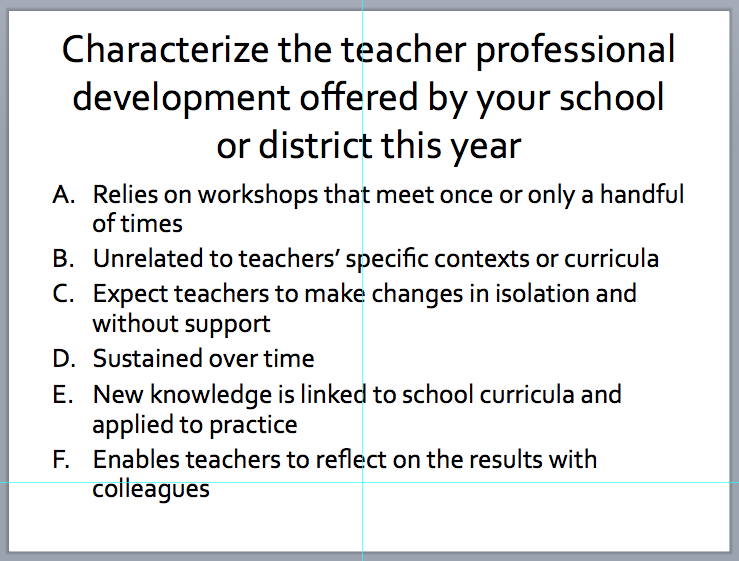 Dear Teacher: if the professional development offered by your school or district is not helping you improve your practice in clear, consistent, measurable ways, then it's up to you to take responsibility for your professional growth. 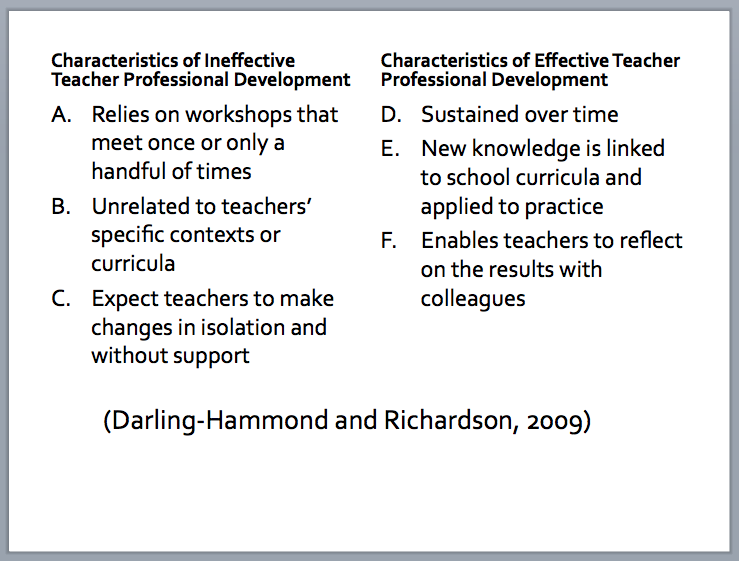 Blogging isn't the only mechanism for that, but it is fun, and it does exhibit the three characteristics of effective PD outlined by Linda Darling-Hammond and Nikole Richardson. It's sustained over time because you're doing it at least a few times a month, it's linked to curricula and applied to practice because you are reflecting on your planning and what went down in your classroom, and it is done in collaboration with commenters and other bloggers. Use your real name, and bonus points for including a picture. This is your professional work and should have your name on it. People resist trusting and interacting with a pseudonym. You have no reason to hide. Put a creative commons badge on your work. It won't stop nefarious ne'er-do-wells from publishing your stuff under their own name, but it does give you some recourse should that ever happen. Put pictures in your posts. For whatever reason, people are more likely to read and interact when there are pictures. I suppose readers are averse to an unbroken wall of text. The arrow at the top points to links to Bree's short stories. I'm not suggesting you should publish short works of fiction, but this message is more, you do you. Be your authentic self. Bree is a good writer and storyteller, and that talent comes through in all of her writing. I am kind of dry and practical and occasionally sarcastic. Hedge does this stream-of-consciousness thing that goes with her personality. Sam enthuses. Fawn swears. People respond to writers, in this genre, who are being themselves. This is a comment left by Tina Cardone on Bree's blog. Tina's name is a link. If I clicked on it, it would take me to Tina's blog. If you would like more people to read your stuff, it helps to read their stuff, and let them know you did in this way. If your comments are quality, people will be curious about you and go check you out. 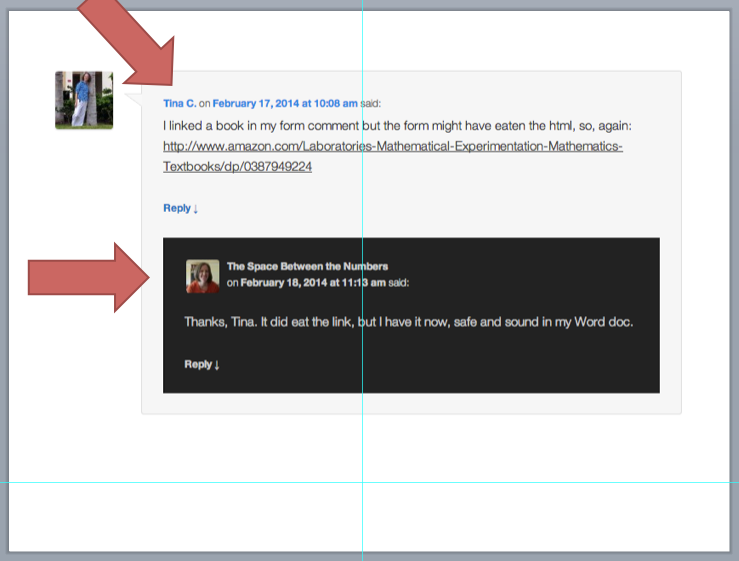 You just include your blog's URL in a special spot when you leave a comment. Also shown is Bree's response to Tina. This is a tip to engage commenters, answer questions, and have a dialog with them. Final thing, for which there is no graphic, is that it's okay to reach out. If you have been writing for several months and feel like you're talking to yourself, shoot an email to a few people you read and admire. Ask them to consider sharing a link to your blog, if they like what you're doing. This is a gracious and generous community. This is a screenshot that a teacher took for me at her school. AT HER SCHOOL. WORDPRESS IS BLOCKED AT SCHOOL. Admins, you have to find a way to unblock everything you can for teachers' accounts. Same goes for Youtube, and Google Hangout, and just as much as you can. If your mission statement includes the phrase "21st century learning," and you are denying teachers access to the tools of 21st century learning, you're not really doing it. I know there are privacy concerns and bandwidth concerns, but this is a problem you need to solve. 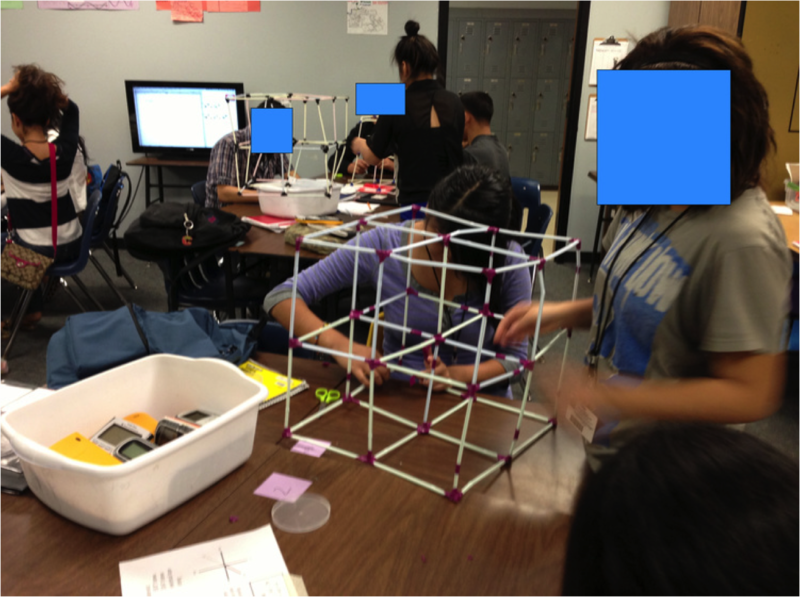 This is a picture from the blog of Jonathan, a high school teacher in Texas. 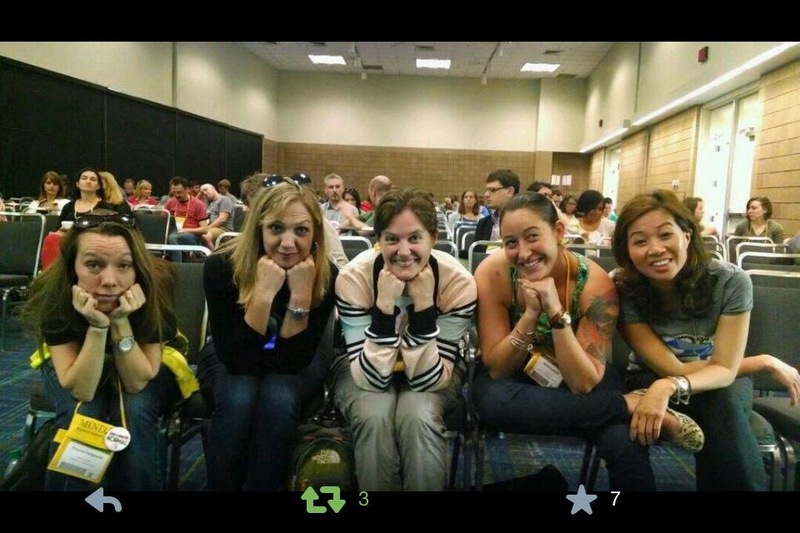 He posts photos from his classroom, but edits students' faces. This practice is, presumably, within the acceptable use guidelines of his district. Some teachers are reluctant to start blogging because they don't know what it's okay to share from their classrooms. Having a clear and well-publicized policy can help. Final tip: find a way to make it count. If maintaining a blog is an additional thing a teacher has to find time for, on top of everything else she has to do, it's hard to keep up with. A decent blog post a few times a month is a time-consuming effort. If you can make that activity count in your district's existing inservice credit program, or find a way for blogging to replace another PD commitment in which the teacher already participates, it would be a huge encouragement. For practical reasons, but also to communicate that you recognize blogging as a worthwhile pursuit. 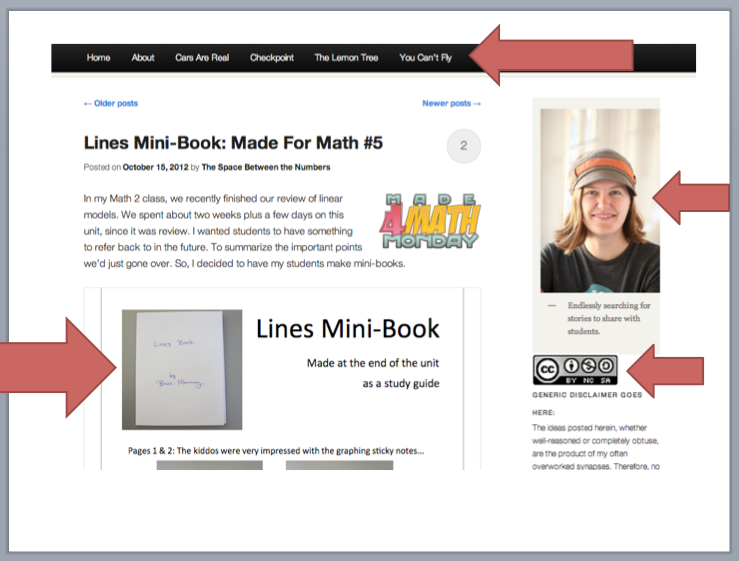 I ended on a link to the Welcome to MTBoS page, for people looking for blogs to start reading, and that was that. I had about fifteen minutes to spare, so I took some questions. I'd tweak it a bit next time. First, it needed a better ending. The ending just kind of appeared abruptly with a thud. I need to end with an inspirational quote or a call to arms or somesuch. Second, Sadie suggested offering some examples of easier onramps to blogging, like a 180 blog. If this is all too intimidating, just commit to seeking out, taking, and posting one photo a day from school. That is an excellent idea. Because, boom, you're blogging -- the task is easy and you can figure out all the technical stuff in the process. And more important, it gets you in the habit of paying attention to worthwhile things to share. I wish I had thought of that. If you want to talk about any of this, you know the way.